Published: Dec. 4, 2011 at 07:27 p.m.
(:32) (Shotgun) E.Manning sacked at NYG 41 for -7 yards (C.Matthews). FUMBLES (C.Matthews), RECOVERED by GB-B.Raji at GB 49. B.Raji to 50 for 1 yard (C.Snee). Officially, a sack for 0 yards. The Replay Assistant challenged the fumble ruling, and the play was Upheld. Published: Nov. 20, 2011 at 05:20 p.m.
(3:08) B.Raji right guard for 1 yard, TOUCHDOWN. Published: Nov. 20, 2011 at 01:12 p.m.
Packers NT B.J. Raji is taking limited snaps on defense, but coaches let him pound in a 1-yard touchdown run against the Buccaneers. Published: Jan. 23, 2011 at 06:48 p.m.
(6:12) C.Hanie pass short left intended for M.Forte INTERCEPTED by B.Raji at CHI 18. 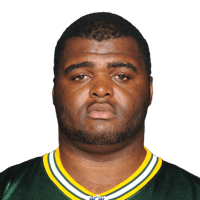 B.Raji for 18 yards, TOUCHDOWN.